Anna - Hi there yes and welcome to Ely. This week we're at the King's School in Ely and we're going to be doing some really amazing experiments with some music and of course a lot of science thrown in there for good measure, because that's what we're all about. This week we've got our helper Wendy. Wendy. What are you doing here today? Wendy - We're going to do some experiments here today about resonance and vibrations but using a couple of very simple kitchen props. Anna - So you heard it here. We need you to get your equipment out so you need to listen very very carefully because it involves things that you have in your kitchen. But first, we're going to speak to some of our student helpers. Do you want to tell us your names and your ages please? George - Hi I'm George and I'm thirteen. Anna - Hi George. And yourself? Tom - Hi, I'm Tom and I'm thirteen. Anna - And what's your favourite thing about science Tom? Tom - I like the practicals. Anna - And what about you George? Are you a practical man or a theory man? George - I like practicals, especially burning stuff. Anna - Good answer. So Wendy, what is it that people are going ot need to get hold of from their kitchens today? Wendy All they're going to need to join in if they want to try this experiment out is just a wine glass. Anna - Just a wine glass. Well that's easy. So go out there now and find a wine glass, and that's a proper wine glass, not plastic I take it? Wendy - Yeah that's right. It's quite good if it's fairly thin glass; nothing too chunky. You do need access to some sort of liquid too. Water will be fine. Anna - Ok, so we've got our wine glass here. What do you want George and Tom to do with it? Wendy - George, if you could just fill up the glass for us, about three-quarters full. Anna - George is just filling up the wine glass. I think it's almost about right. Wendy - And if you just want to pass that to me. Now what're going to do is use the wine glass as a musical instrument. There's a very famous experiment some people might have heard of where an opera singer sings a note and makes the glass shatter. I wish I had a good enough voice to do that, but I haven't so we're going to play the wine glass in a slightly different way. Anna - Ok, so are you going to get Tom to play the wine glass? Wendy - Yes. I'm going to put the wine glass on the table to give it some stability. To play it, Tom, you have to put one hand on the base to keep it steady. Sip a finger from your other hand in the water and then rub it around the rim of the glass. Don't press too hard, just rest your finger on the rim. Anna - Ok so this is one of those well-known party tricks where you play the wine glass and Tom's going to try it now. Wendy - And when you're very close up you can actually see some of the vibrations on the water too. Anna - Well done Tom. That was really great. So what's the next part of the experiment. Obviously we don't want to play a tune with one note. How can we change it? Wendy - Yeah, music would be pretty dull if we only had one note to listen to, so what we're going to do is change the glass and set people the challenge of predicting scientifically what's going to happen. It's a very simple change we're going to make. All I'm going to do is drink about half of the water out of the glass and I want people to think about what will happen to the note. Anna - Ok so while Wendy glugs away at some of the water out of that wine glass, I'm going to ask George, what do you think will happen to the note now that Wendy has drunk some of the water? George - I think the pitch will change but I'm not sure which way. Anna - You're not sure which way, but that's a good prediction. Tom, do you have any ideas about whether the note will get higher or lower? Tom - I think the note will probably be higher. Anna - And why do you think it will be higher? Tom - I'm not sure but I've just got a feeling that it might be. Anna - Well we will see exactly what happens to the note. Wendy has now finished her drink but we're not actually going to be finding out right now. We're going to get George and Tom to wait here in their school in Ely before we find out exactly what happens. Until then, we want you to get hold of a wine glass, get hold of some water, dip your finger in it, make the sound, drink half of it and then make the sound again. We then want you to tell us what happens. We'll be back later in the show, so until then, back to the studio.
. Anna - Hi there yes and welcome back to the King's School in Ely where we've been doing some experiments with wine glasses. Hopefully you have at home too. In the earlier part of the show we filled a wine glass with water and one of our helpers Tom ran his finger around the top and made a noise. Then what we asked you to do was drink half of the water from the glass and play the note again. Now we're going to find out exactly what happens. So Tom, can you now make the noise again? A beautiful sound I think you'll agree. Now we want to see what happens to the noise when your pour out some of the water. Do you want to pour some of it down the sink then Tom? Is that about enough Wendy? Wendy - Yes that's fine. Anna - Ok, now what we want you to do is make the noise again and see how it's different. So George, you heard the noise before and you heard the noise after we got rid of the water. What happened? George - It got higher. Anna - It got higher and I think Tom said that that's what he thought might happen. But you didn't know why. So Wendy, why does running your finger around the top of the glass make a sound in the first place? Wendy - Well the important thing here is a force called friction. When you rub any two things together there's a certain amount of friction where things stick. Now you've wetted your finger it's quite slippy but there's still a tiny amount of sticking and slipping going on as you do that. So each time your finger grips and then slips all of a sudden, it gives a bit of energy to the glass and makes it start to vibrate. Anna - What happens then when something vibrates? How does that make a sound? Wendy - Well depending on how much stuff you've you got, it defines how fast the vibrations will be. Everything of different sizes likes to vibrate at a certain frequency and that's resonance. Everything has a natural resonance that it likes to vibrate at. If you take a glass and a certain amount of water, then it wants to vibrate at a certain speed which gives us a certain note. Anna - So how come that when you've got less water in the glass, the note gets higher? Wendy - Well it's quite easy to think about and is something everybody has probably tried. If you get a ruler sticking out over your desk, if you've got a long bit of the ruler and you twang it, it wobbles quite slowly and gives you a low note. As you make the ruler shorter, it goes faster and gives you a higher note. So when you've got less water and less stuff like the short ruler, it's wobbling fast and gives you a high note. Tom - What would happen if there was no water in the glass? Anna - Ooh good question. Wendy, what would happen? Wendy - It often depends on the glass itself but it should in theory work with no water at all because it's effectively just the glass itself that's vibrating then. But the note would be a lot higher. So if we took all the water out of the glass now, the note would still carry on getting higher. Anna - That sounds to me very similar to if I blow over a milk bottle, for instance. Is that the same principle? Wendy - It's a similar experiment but there's a key difference. We've got a milk bottle here and it's almost full. To make this vibrate, rather than running my finger around the bottle top, what most people do is blow across the top. Wendy - Now I'm going to empty some water out. Now remember when I did this with the glass, what happened to the note? Wendy - That's right. Now let's see what happens in the bottle. Anna - So Tom, what happened then? Tom - It got lower. Anna - Now that's the opposite to what happened in the wine glass. That's absolutely insane! Why did that happen? Wendy - It's a bit sneaky isn't it?! The key difference is that the music is being made in a different way. 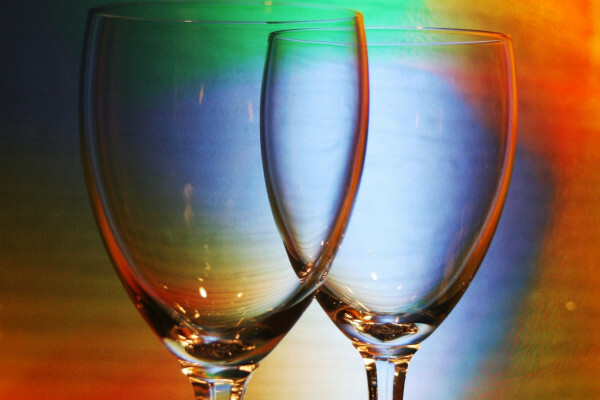 When we rub the wine glass, the movement of the glass and the water is what's vibrating. When we take water away, we've got less stuff and a higher note. With the bottle, instead of touching the bottle, we're blowing across the top so it's the air that's vibrating this time and not the water and the glass. Anna - So when you've gone and poured half the water down the sink you've actually got more air, so that's like when you have more water in the glass, and the note is also lower. Wendy - Exactly, it's the opposite result. Anna - Wow, that's absolutely amazing. Thanks very much Wendy. George and Tom, what did you think of the experiment? You first George. George - Yeah it was interesting. Anna - And Tom, have you done anything like this at school before? Tom - No, not really. Anna - So next time you learn about sound at school you can be the envy of all your friends by being an absolute super-brain. Well thanks very much Wendy, Tom and George and thanks to the King's School in Ely for having us here today and we hope you all enjoyed it too. Back to the studio and we'll see you all next week. Pick the one that rang for the longest. Wet your finger, then gently rub it around the rim of the glass - don't press too hard or you could break the glass. Try adding some water to the glass, try again. - Is there any difference? You should find that any glass that will ring for more than 3-4 seconds will start to vibrate and produce an eerie note as you move your finger around it. It may take a while to get the knack but it should work. Different glasses will produce different notes and will work differently well, you should find that the glasses that ring for longest after you ping them are easiest to play. If you add water you should find that the pitch of the note goes down. These effects are all to do with a principle called resonance. Some things have a speed that they vibrate at really well, for example a swing - just by wobbling your legs at the right speed you can build up a great big swing and have lots of fun. Your finger is doing something similar to the glass, as you slide it around, it will tend to stick, then slip, then stick then slip. Some glasses have a speed at which they will vibrate really really well, if this sticking and slipping is at about the same speed as this the vibration will build up enough that you can start to hear it as the eerie note. Some glasses are better at vibrating than others, cheap ones tend to have minute flaws in their structure that rub against one another while the glass is vibrating causing it to loose energy - a bit like putting your feet down on a swing. In this case you are never going to get it to vibrate well. The best glasses are large crystal wineglasses that haven't been decorated. If you add water to the glass it essentially makes the glass heavier so it takes it longer to vibrate back and forth so vibration is slower and therefore the pitch is lower. Although it was later discovered that they were marking the notes with lead paint, and the players were licking their fingers to play the insrtument, and therefore eating lots of poisonous lead paint, which was probably more of the problem. Next How does a submarine work? why do people tell me that they don't like the sound? I have a relative of Russian Jewish heritage who played the musical glasses from 1920-1040s then his daughter took over. He was called The Great Silvo, she was my aunt Silvia stage name Silvia Silvo.